Christmas is fast approaching, and in this time of snow, wind, rain and religious people attacking you on the street with their twisted messages of 'peace' and 'goodwill', it is important to remember the true meaning of Christmas, a celebration of our saviour. 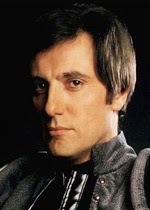 Paul Darrow, aka Avon from Blake's 7 is perhaps the closest representation of God on Earth we shall ever see. I mean, did Jesus dress up in studded black vinyl and fight the fiendish Federation, whilst beating up women? I don't think so! So of course, I decided to celebrate Avon! Avon is perhaps the best hero ever! Prancing about in crazy outfits, he won the hearts of the British public, who even sent money to the BBC to buy him acting lessons. What other good guy slaps about women and kills the title character of the show (the aforementioned Blake)? Silly Avon, ruffle his hair, the scamp. So run up to your office printer and reserve your spot, I'm sure everyone will be eagerly printing this all off to hang proudly on their walls! Here we have Avon taking time out from fighting the evil Federation to make a delightful snowman, the little rapscallion! One for all the ladies! Avon is such a lovely chap, he got a big Easter bunny for all the orphans and animals and stuff to play with. What a guy! Avon relaxes on the beach with his cool surfboard, and takes pot-shots at all the welfare cheats. Avon playing beach volleyball! Yay Avon! Avon loves animals! Here he is having bought a new fishtank for his pet goldfish. Everyone has to go back to school, even Avon! Here we find him learning how to cross the road! Avon dressed as Avos The Mighty for his Halloween party! Silly Avon! Avon showing his good friend, the Earl of Rochester, some of his poetry. They both write on similar subjects. YUM! Christmas dinner with Avon! It's like he's at your house!